Hi and welcome back friends! It's Heartfelt Creations Inspiration Wednesday and I have another card to share with you from the absolutely gorgeous Classic Wedding Collection. This collection is so beautiful, it literally takes my breath away. 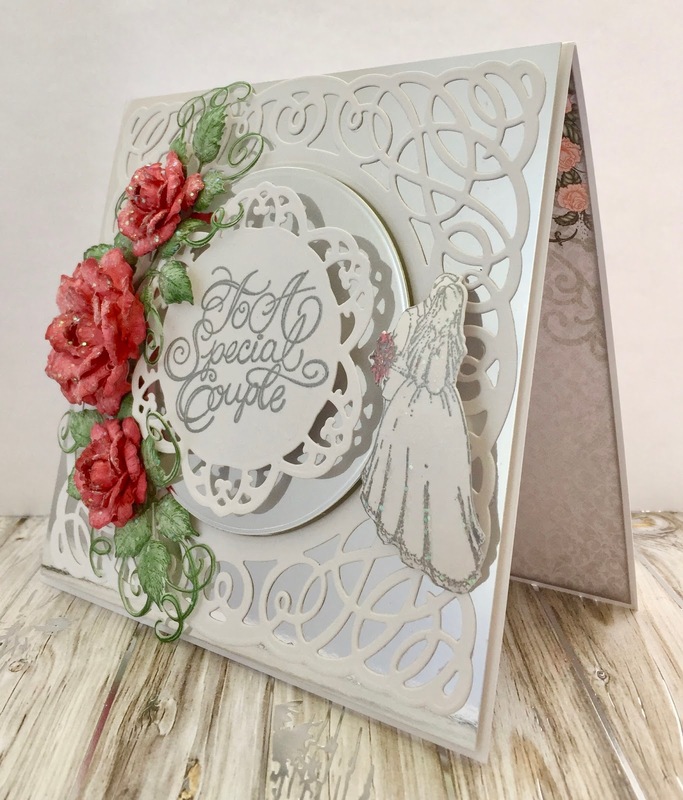 Please be sure to stop by the Heartfelt Creations blog to see all of the magnificent projects from the amazingly talented design team! Other Products: Pearl White Metallic Cardstock, Mirror Cardstock, White Cardstock, Brilliance Pearlescent Ivy Ink Pad, Spellbinders Intertwined Spirals Die, VersaMark, Silver Embossing Powder, Heat Gun, Distress Clear Rock Candy Crackle Paint, Misti, Big Shot, Dimensional Tape, paint brush, hot glue gun. Instructions: Create a 6” x 6” card base with the Pearl White Metallic cardstock. Mat with 5 7/8” x 5 7/8” mirror cardstock using dimensional tape. Cut one of the panels from the paper pad and adhere to the inside of the card. Die cut the Intertwined Spirals and adhere to the Mirror cardstock with Dries Clear Glue. Using the circle from the die set, cut a circle with the mirror cardstock and adhere as shown with dimensional tape. Stamp sentiment and bride and groom with VersaMark and heat emboss using silver embossing powder. Cut out the sentiment using the decorative center of the Intertwined Spirals Die and adhere to the mirror circle using Double Dots. Cut out the bride and groom with the matching die, shape with the Deluxe Flower Shaping Kit and color the bouquet with Pearlescent Coral and Pearlescent Poppy inks using the Stack and Store Daubers. Glitter the Veil, bouquet and dress with Dries Clear Glue and Rajni Chawla’s Crystal Clear. Thank you so much for stopping by...I really appreciate it! Beautiful card! The mirror silver cs is a neat texture to ground your card,neat idea! Your flowers are beautiful! 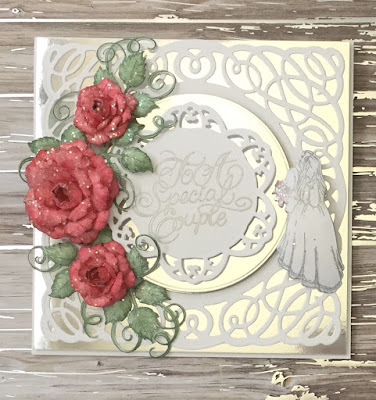 I'm a big fan of HC, especially their flowers--I first want to buy the petunia flowers, and the very intricate new die set from the wedding collection especially. I adore your roses here. Just the right amount of sparkle! 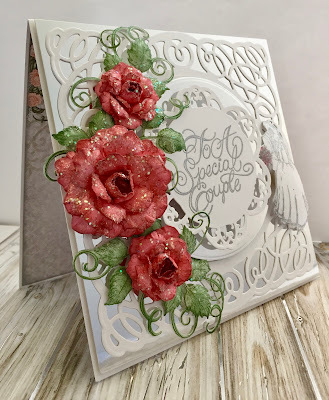 Gorgeous card and love the roses!